I created the British Milksheep (also known originally as the Alderbred) in the 1960s to fill a gap in the sheep industry. At that time many breeds were focused on the showring and fashion points to the detriment of their performance credentials, and other breeds were fixed in a pattern of breeding that had become outdated. There was need for a crossing breed that would consistently sire daughters capable of achieving a 200% lamb crop with adequate milk to rear triplets. The British Milksheep was created to provide these levels of prolificacy and milk yield, combined with good conformation and carcase qualities. It became established in flocks throughout Great Britain, and a Flock Book was published in 1983. It also attracted considerable attention from abroad and, despite the restrictions on export to some countries (such as Australia, NZ and USA), breeding flocks were established in France, Greece, Portugal, Spain, Hungary, Canada, Mexico and Kenya. Although it was developed originally for maternal characteristics (prolificacy and milkiness), the British Milksheep possesses good wool and carcase characteristics. Its robust conformation yields a high killing out percentage and good carcase grades. The Bzikot flock in Canada was able to sell both dairy and meat products from the flock into the speciality quality market. 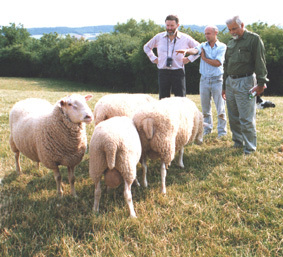 Thus it is fitted not only to be a high-performance crossing sire breed (its main use in most countries, and especially in Hungary), but also a breed that lends itself to self-contained flocks which is increasingly attractive in the light of the growing threat of disease where replacement ewes are purchased. Lifetime production and longevity was recognised by merit awards, and many purebred ewes qualified for the '25 Club' by producing at least 25 lambs. The record is held by Lucky 11th (6018) who produced 44 lambs in her lifetime without the assistance of any artificial hormonal aids. The credentials of the British Milksheep as a crossing sire were established by independent evaluation when Scottish Agricultural Colleges undertook a comparative breed trial by crossing North Country Cheviot ewes with five crossing sire breeds - British Milksheep (BMS), Border Leicester (BL), Bluefaced Leicester (BFL), Bleu du Maine (BDM) and Rouge de l'Ouest (RDO). The British Milksheep transmitted the best performance to its crossbred daughters (see table below) and the results were published in 1997. The efficiency of the British Milksheep halfbred ewes was increased further because they were 10 kg lighter than the halfbred ewes sired by the Border Leicester and Bluefaced Leicester, yet they produced a greater weight of lamb from each ewe, giving them a productivity rating 13-15% higher than the two British breeds, and 25-33% higher than the continental breeds (measured as the output of kg carcase weight of lambs per kg metabolic weight of the ewe). First-cross wether lambs by the BMS rams had the highest conformation score (average 3.1) ahead of the BDM and RDO crosses (3.0) and BFL crosses (2.9) with the BL crosses bottom (2.8). However, the BL crosses had the highest daily liveweight gain with 0.13 kg, ahead of the BMS crosses (0.12). Slaughter lambs out of the 1st cross BMS ewes by terminal sires achieved good growth and killing out %. BMS rams were the best for carcase grades of their halfbred wether progeny, prolificacy and productivity of their halfbred daughters, and killing out % of the finished lamb in the F2 generation. 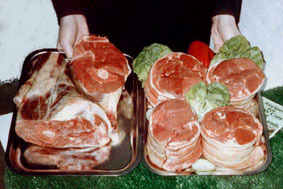 The meat and carcase quality of British Milksheep was confirmed in comparative breed trials in Hungary at the University of Debrecen in 1998. In direct comparison with three specialist terminal sire breeds (Ile de France, American Suffolk and Mutton Merino) it obtained the highest rating based on four important factors. The current name of British Milksheep is somewhat misleading as only a small portion of the breed is used for dairying. It was exported to France and Greece where it was used for dairying, and some major flocks in the UK specialised in dairy products (e.g. 'Kelton Blue' a speciality cheese from northern England). It produces milk with high solids content, and 168-day lactation yields of 250 litres or more can be expected under average management. For example, in 2006 most of the mature BMS ewes in the Bzikot flock in Canada produced over 300 litres after weaning lambs at 50 days. Performance varies between families. For example at the dispersal of the 800-strong Broadhembury flock in Devon in 1990, both the Blossom and Style families demonstrated the ability to transmit 400+ litre lactations down several generations. In Hungary the most common breed is the Merino which has low productivity of both milk and lambs. Several breeds have been used for crossing to increase productivity but the British Milksheep was the most successful. The creation of a new breed is a significant development within the livestock industry. Many attempts fail because they do not cater for an identified need or because they lack the resources to break into an established hierarchy of breeds. The ability of the British Milksheep to find a place in the industry is matched by that of Luing cattle in the UK or, in earlier times, by Bonsmara cattle in South Africa. 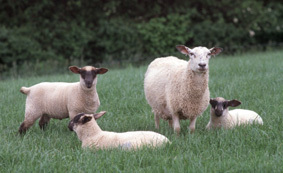 The creation of the British Milksheep was based on a vision of a breed that would sire halfbred daughters able to rear 200% lamb crops and have sufficient milk for triplets. Prolificacy is a major factor affecting profitability. I already owned high-performance flocks of Bluefaced Leicester and Dorset Horn/Poll Dorset sheep together with Eastrip Prolific (a new prolific strain derived from individual ewes discovered within recorded flocks of several native breeds, including Llanwenog, Lleyn and Clun Forest). A small number of carefully selected individual animals were sourced from other breeds such as Texel and Fries Melkschaap. These animals were mated in a planned programme designed to blend the desired qualities, whilst maximising the diversity of the founder group. A detailed recording system was instituted at the start of the project, and a performance registry was established. Only animals reaching the stiff performance targets were accepted for registration. 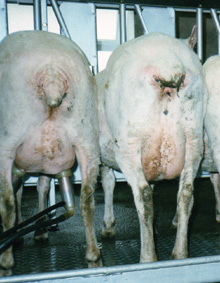 The British Milksheep was the first breed to employ this system, which was used effectively by other breeds such as Red Angus cattle in the USA. The breed was kept under my personal control until performance levels reached their targets and numbers permitted an effective breeding programme. Breeding ewes had been sold, but in 1981 the ability to participate in the breeding of pedigree British Miksheep was extended to other breeders who were members of the Breed Society by making rams available to them. A full description of the creation and development of the breed is being prepared. The FMD outbreak in the UK in 2001 hit the main concentrations of the breed in northern England, Scottish Borders and South-West England, and a high proportion of the breed was slaughtered in the disease control procedures applied by Defra. Consequently, only a small nucleus of the breed remains in the UK, but it continues to flourish abroad, especially in Hungary and Canada.